Our Ingredients | Valhalla Beard Care, Feed Your Beard! Read below as we share some of our product ingredient choices and know that we have selected the best available to provide you with the highest quality beard oils and balms. Our ingredients are ethically sourced and are guaranteed Natural & Organic & Cruelty Free. Aromatic Description: Argan Carrier oil has a strong earthy scent that is quite characteristic of this oil when it is raw and unrefined. Note: In rare instances, Argan oil has been known to cause reactions in people with severe nut allergies. Description: Organic Hemp Seed Oil is said to be rich in omega 3 and omega 6 essential fatty acids (EFA's, good healthy fats), it has a full amino acid spectrum meaning that it provides complete protein and it has a high mineral content. It makes a fantastic cosmetic grade oil due to its nutrients, though the illegal Cannabis association tends to reduce its popularity. Common Uses: Organic Hemp Seed Oil can be used to nourish the skin and hair due to its high content of proteins and essential fatty acids. Hemp Seed Oil is said to closely match our own skins lipids and the essential fatty acids are readily absorbed into the skin. Hemp Seed Oil soothes and alleviates dry skin, moisturizing it so that the complexion looks revitalized and radiant. Hemp Seed Oil contribute greatly to protecting the skin’s moisture barrier, improving the texture of skin, and reducing the visible signs of aging. Description: Organic Jojoba Clear is a favorite carrier oil. In actuality, it is a liquid wax. It is known to closely resembles the sebum of the skin, and is rich in vitamin E. This gives a healthy looking complexion to your skin. The Clear variety of Jojoba has been put through a charcoal filter removing the color and odor. This ensures the benefits in manufacturing without the risk of odor or product decolonization. It is also important to note that Jojoba may go cloudy in cool temperatures. It will return to its clear state with warming. Purchases of entire drums can also expect some clouding near the end of the drum. This is natural as Phospholipids (natural components of most vegetable oils) hydrate and precipitate out of suspension. The sediment is actually extremely high in beneficial Vitamin E and will only create problems if the oil is heated to extreme temperatures where they will darken and precipitate out of suspension. Any sediment can be decanted out wherever practical. All of our essential oils are guaranteed organic and naturally sourced. Our recipe's are noted on each label to share with our customer the contents of everything they are putting on their body. Coupled with our Organic Essential Oils, some of our products also include Natural Fragrance Oils. Searching for organic Coconut oil? Bulk Apothecary has you covered with our Organic Extra Virgin Coconut Oil! It contains all the Coconut goodness of our Coconut Oil (76 degree), but with the rich Organic Virgin Coconut Oil scent and color included. It has the potential to be used in many industries such as in personal and industrial manufacturing, yet versatile enough you home usage. 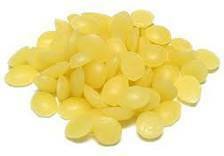 Our all natural yellow beeswax pearls are 100% pure and are filtered to be free of debris. Our wholesale yellow beeswax granules are great for their ease of use but still maintain the characteristic aroma and color that beeswax is known for. You will find them much easier to work with than traditional blocks. Lanolin Anhydrous is high in lipid content and contributes to hydration levels in the skin. Lanolin is easily absorbed into skin cells, which allows it to help repair barrier function and increase skin moisture. Our Lanolin Anhydrous is derived from Sheep Wool. Our white beeswax pearls have been filtered and the color has been naturally removed to create an incredibly clean white appearance while maintaining the natural beeswax smell. 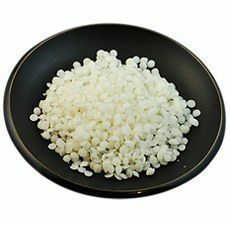 Our wholesale white beeswax granules are incredibly easy to work with which is the benefit to using the pearls. Because of the refinement this was is typically better for lip balm and personal product that require a product that is more refined.